Transparency Market Research (TMR) has published a new report titled ‘Medical Devices Contract Manufacturing Market - Global Industry Analysis, Size, Share, Growth, Trends, and Forecast, 2018–2026.’ According to the report, the global medical devices contract manufacturing market was valued at US$ 47.5 Bn in 2017. It is projected to expand at a CAGR of 10.9% from 2018 to 2026. Expansion in the medical devices industry is anticipated to boost demand for medical devices contract manufacturing during the forecast period. 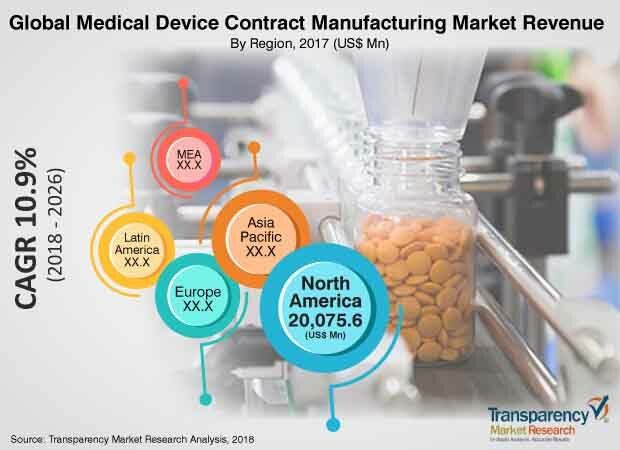 North America and Europe are projected to dominate the global medical devices contract manufacturing market, owing to a highly developed health care sector, increase in awareness among health care professionals about medical devices, and the continuous evolution of technology. Asia Pacific, Latin America, and Middle East & Africa are expected to offer significant potential to the medical devices contract manufacturing market. The market in Asia Pacific is expected to expand at a CAGR of 12.5% from 2018 to 2026. Increase in the number of cases of various disorders across the globe is likely to drive the medical devices contract manufacturing market. According to the WHO, cardiovascular diseases accounted for an estimated 17.7 million deaths in 2015, representing 31% of all global deaths. Among these, an estimated 7.4 million were due to coronary heart disease and 6.7 million were due to stroke. This is likely to increase the number of diagnostic procedures, propelling the global in-vitro diagnostic medical devices, which, in turn, is expected to drive the medical devices contract manufacturing market. In terms of type of manufacturing, electronics is an emerging segment of the medical devices contract manufacturing market. The segment is likely to expand at a significant CAGR. Moreover, it is likely to constitute a major market share due to the adoption of technologically advanced products by diagnostic centers. Moreover, factors such as increase in demand for patient monitoring and diagnostics devices are estimated to propel the segment. In terms of service, the global medical devices contract manufacturing market has been segmented into prototype development, finished device manufacturing, assembly & packaging, testing & regulatory support services, molding & casting, and others. Prototype development is projected to be a highly attractive segment during the forecast period. Prototyping directly determines the direction of the entire project and its eventual success. Additionally, prototyping reduces time and costs. These are the major factors expected to drive the prototype development segment. In terms of application, the global medical devices contract manufacturing market has been categorized into cardiovascular, orthopedic, neurovascular, pulmonary, oncology, laparoscopy, urology & gynecology, radiology, and others. The orthopedic segment held a major share of the global market in 2017. Increase in the geriatric population affected with arthritis and need for patient-specific devices are expected to propel the segment in the next few years. The laparoscopy segment is expanding at a high growth rate, especially in developed economies, due to wide acceptance of and preference for minimally invasive devices, and the trend is likely to continue in the near future. In terms of region, the global medical devices contract manufacturing market has been segmented into North America, Europe, Asia Pacific, Latin America, and Middle East & Africa. North America dominated the global medical devices contract manufacturing market in 2017. In terms of revenue, the market in North America was valued at US$ 20.1 Bn in 2017, owing to a highly developed health care sector, increase in awareness among health care providers about medical devices, and the presence of key players in the region. This region offers a significant opportunity to the medical devices contract manufacturing market. The medical devices contract manufacturing market in Asia Pacific is anticipated to expand at a CAGR of 12.5% during the forecast period, due low cost of products and labor for manufacturing. Moreover, expansion of the health care sector in countries such as China, Japan, and India offers significant potential in this region. Additionally, technological advancements and increase in the rate of adoption of medical devices are expected to propel the market in the region during the forecast period. The global medical devices contract manufacturing market is highly fragmented in terms of number of players providing different products. Key players in the global medical devices contract manufacturing market include Flextronics International, LTD., Jabil Inc., Benchmark Electronics, Inc., Integer Holdings Corporation (Greatbatch), West Pharmaceutical Services, Inc., Tecomet, Inc., Nortech Systems, TE Connectivity (Creganna Medical), Forefront Medical Technologies, and Nordson Corporation. Expansion of product portfolio through mergers and acquisitions is a key strategy followed by several global players.